I know there are folks there that probably saw anchovy paste and stopped reading. But that ingredient is one thing that adds something special to the dressing. It's salty with a bit of depth. Without that component, I find the dressing to be a bit flat and bland. The great thing is anchovy paste comes in a tube (just like toothpaste!) and you can just squeeze the small amount in and not have to deal with little anchovies. Look for anchovy paste near the tomato paste tubes within the canned tomato aisle. If you are a fan of Caesar dressing, the recipe can be doubled easily and be made in advance too. Heat a grill pan over high heat and coat cooking spray. Meanwhile, season chicken breast with pepper, salt and garlic powder. Add chicken to pan and cook for 4 minutes on each side or until done. Remove from pan and let stand 5 minutes. Cut chicken into slices. In a medium bowl, whisk together the pepper, vinegar, oil, garlic, mustard and anchovy paste. Combine remaining 1/4 teaspoon pepper, vinegar, and next 4 ingredients (through anchovy paste) in a large bowl, stirring with a whisk. Add the romaine to the bowl and toss to coat. 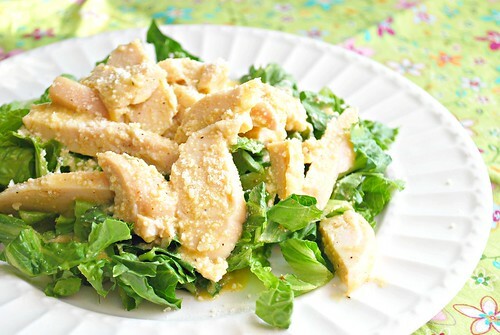 Divide lettuce and chicken evenly among 4 plates and garnish with croutons and a tablespoon of Parmesan. Caesar Salad is one of my son's go-to salad choices - adding to our summer list. This seems to be a very easy to follow recipe. Looks really delicious. Thanks for sharing. I love to use anchovy paste. I can't stand an anchovy but love the flavor the paste gives to food. This is the perfect summer dinner.